We’ve discussed the possibility of applying Moore’s Law in computing to solar technology before, due to the exponential improvements in solar over the past several decades, and the expected trajectory in coming years. Now this notion has come to the fore once again, with the revelation that two-thirds of all solar PV (solar panel) capacity installed in the world has been installed since January 2011. That’s pretty incredible when you break it down, as Greentechmedia has for us already. It took almost 40 years for 50 gigawatts of solar capacity to be produced and installed worldwide, but over the past 2.5 years that has doubled to 100 gigawatts. 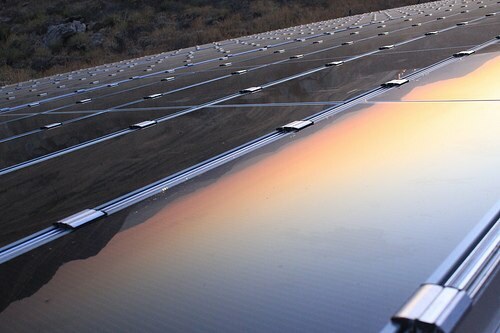 Over the same period, global prices for solar modules have dropped a massive 62 percent. Further, keeping up with this exponential growth, solar is on target to double capacity again to 200 gigawatts by 2015. GTM Research points out that the declining costs of installing solar are also beginning to “open up markets without incentives”. In fact, about 3,000 residential solar systems were installed in the state of California in the first quarter of 2013 without the assistance of state incentives. This is a very encouraging sign for a future without the need for government subsidies for solar. It has to be said, again, that the future is looking very good for the growth of solar power around the world. However, as has also been pointed out, the solar market is still just at the beginning of its expected “steep growth curve”, so the solar industry could change significantly over time, as it starts to mature. The technologies and business models of today may not be the same as the ones that emerge and survive into tomorrow. In any case, that may be less important for those wishing to install solar panels at a reasonable price to generate their own electricity.